For the rose gold lovers out there, I’m sure you would have to agree that this precious metallic tone is packed with equal parts charm and allure. And it goes without saying, it’s the ultimate in exuding effortless romance. Put your hands up if you agree that gold with a tint of pink delights in revealing its more glamorous side than solid silver or gold ever will. It’s really no surprise that rose gold has become a popular choice for engagement rings and wedding jewellery over the years. Although admirers of rose gold will shout this from the hills, this metallic tone has been enjoyed in the jewellery space for many decades. When I think of rustic rose gold wedding inspiration, I’m always drawn to rose gold’s nostalgic elements. And there’s no better way to showcase this feminine tone than balancing it with tones of aqua, gold, copper, greens and neutral tones to evoke old world charm and opulence. Think a countryside affair, a beautifully decorated barn with fresh flowers galore and the lush green foliage of the venue to create an atmosphere of intimacy and romance. If I haven’t shared my love for this colour enough, I must say that the best thing about rose gold is its versatility! It can just as easily find its way in a city hall or church wedding with classic tones of black, ivory and silver. 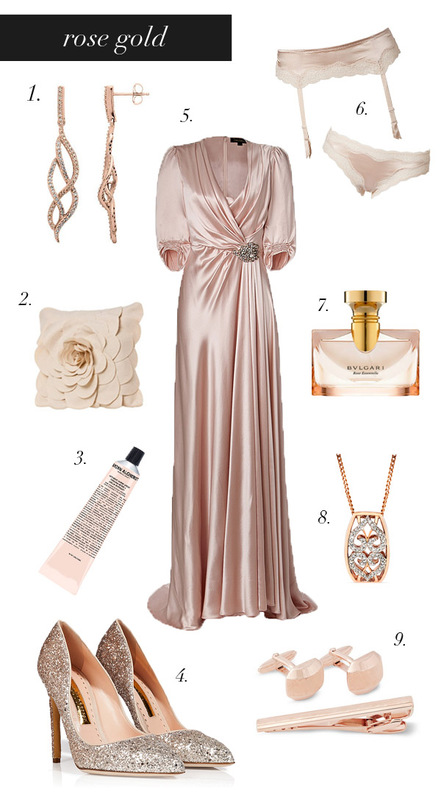 Personally I think you can’t have rose gold without the glamour. Which works out well because this pretty metallic tone is inherently glamorous and adds an effortless splash of dazzle and glitz without even trying. Perfect for day time or evening nuptials wherever you intend to hold your big day.